Water damage is something that may occur unannounced and may escalate to serious damage including financial issues if not handled on time. From that tiny hole that has been leaking inside a wall to the rusted pipe inside of a drywall, there are times when the water damage may be so massive that it may actually require the entire affected area to be replaced completely. Superior Cleaning and Restoration Inc. has for years been serving the people of Encinitas, help tackle all aspects of water damage resolution. Not only can our experts assist you with the drying and remediation stages of the process but we can also help you with the re-construction as well as the re-modelling stages. Our experts are proficient in the assessment of water damage and the resulting repair work that might be necessary to restore your home back to perfect condition. No absolute prevention measures for serious floods exist, as a result, we offer flood damage control services. In areas that are prone to natural disasters you should file for insurance coverage. We work in conjunction with leading insurance companies to help you recover the damage costs and to get you back on your feet in record time. Superior Cleaning and Restoration Inc. is a preferred company by insurance companies like Allstate and Farmers. We can bill insurance companies and work with adjusters directly which speeds up the claims process. 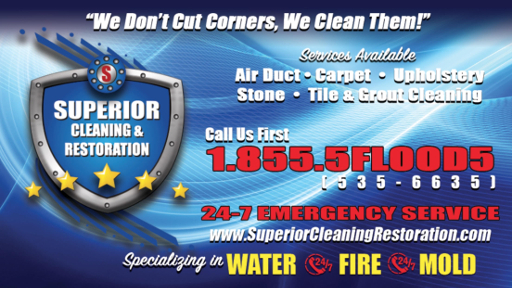 At Superior Cleaning and Restoration Inc. we understand the urgency of your needs. As a result, we are fully equipped to tackle any situation that comes our way. Be it sewer spillage or leakage in crawl spaces, we can handle almost any type of clean up job. For the businesses of Encinitas we provide commercial plans for water damage restoration. Our services have been certified by the Institute of Inspection Cleaning and Restoration Certification Program.